Data analytics is a tedious, laborious process at both the enterprise and consumer level. At the digital agencies whose core value proposition is digital analytics, the process of accumulating, cleansing, and presenting data accounts for about 70% of their total time spend. Offering a software toolset that improves the speed and simplicity of performing data analytics presents a unique opportunity for those who engage this work on a daily basis. 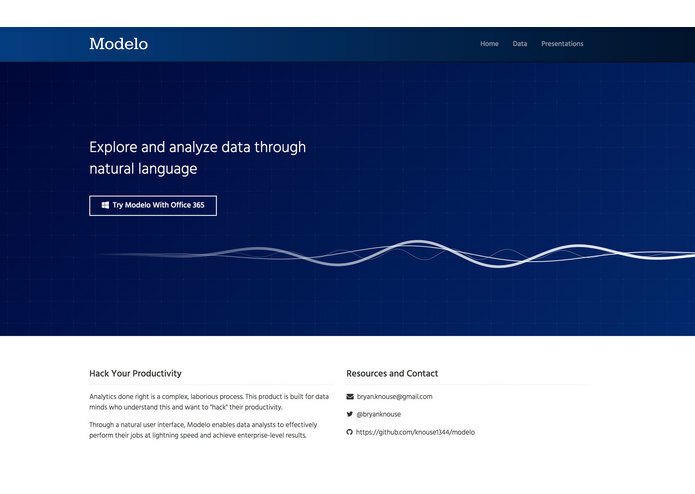 Modelo empowers you to explore and analyze data through natural language. Grab files from your OneDrive or Office 365 account and pull them into Modelo to begin exploring data. Use Modelo to gather basics insights about your data - types of data, missing data, how much data. 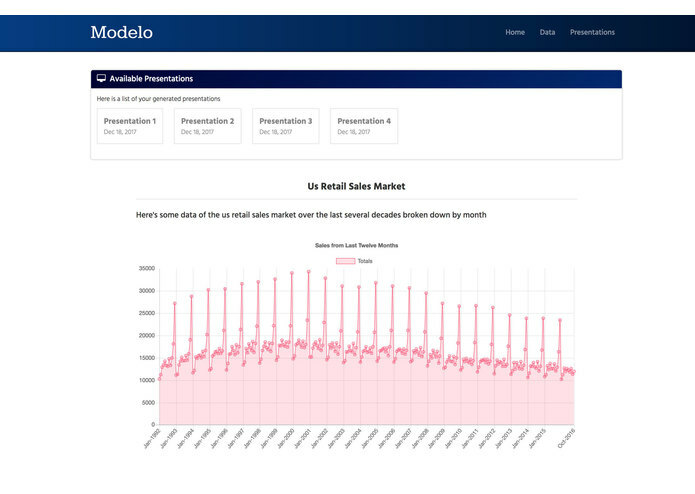 After you have sufficiently explored your available data, you may create presentations through Modelo. 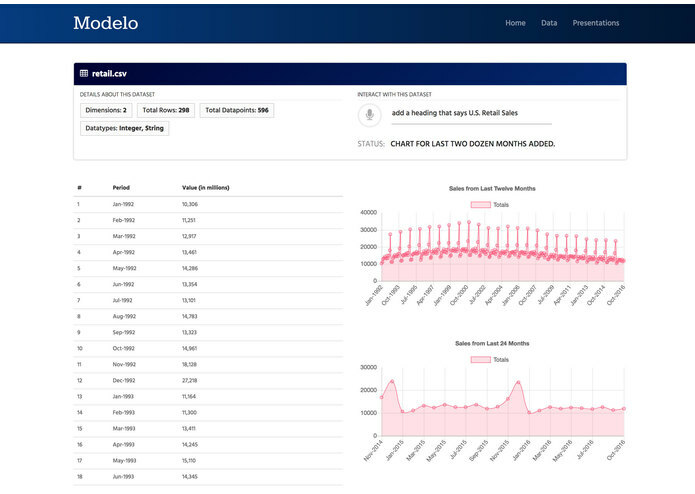 Whether you are an agency executive preparing a major client pitch, or an analyst within the enterprise, Modelo can significantly improve the speed and simplicity of your daily workflows. I love Microsoft tools, but the graph/office 365 API is complicated to use. I also found some problems with the API that I've explored with the community here on Devpost and here on Stackoverflow. I would be more than happy to put the challenges I found in writing, along with my hypothesis for solutions. Additionally, I feel that these MSFT APIs would greatly benefit from a unified UX in both aesthetic and concept. There are many places and ways to access the APIs, and while it seems like more choices would be useful I found it to make the process more clouded. Modelo is powerful on complex datasets and yet so simple to use. As I personally find most enterprise software to 'taste like cough syrup', I absolutely love building simple, powerful enterprise software. As I have found many times, Microsoft tools are really powerful for developers (if sometimes a little buggy). Additionally, creating powerful enterprise software is as much a challenge of fitting into an enterprise workflow as it is a challenge of actually building the technology. Too often developers can get stuck in the weeds of how to code something, and fail to address the larger problems with the challenges we are trying to solve. This experience was another data point in my journey to better understand how to solve problems in the enterprise through software. I am going to continue building out conversational capabilities to make conversation simpler, more fluid, and larger in breadth. Consequently, the application will require more capabilities to handle larger and more complicated datasets. Additionally, Modelo will need to account for the numerous idiosyncrasies between datasets such that this product can support an ever growing slice of the digital enterprise. Additionally, I am going to take this to several agencies I work closely with in New York City and investigate paths to bring this product to a paid pilot and, hopefully, a fully functional enterprise software.